A common quandary when blessed with the gift of caterpillars noshing nearby is whether or not it’s safe to relocate them once they form their chrysalis. Tom Pelletier of the Ask A Naturalist website wrote today, explaining that six gorgeous Monarch caterpillars were busy at work on a milkweed plant in a yard adjacent to a high traffic sidewalk. How do you think these Monarch and Queen chrysalises got here? They’re adhered with tape. The answers are yes, you may relocate the creatures once they make their chrysalis, and no, the caterpillars do not need to chrysalis on milkweed. In fact, Monarch and other chrysalises often are found as far as 30 feet from the hostplant where they ate their last meal. Entomologists speculate that caterpillars leave their host plants to protect themselves from predators. “Caterpillars frequently strip the plant, so to form a chrysalis on a naked plant would leave them terribly exposed,” said Mike Quinn, an entomologist and founder of the Austin Butterfly Forum. My unscientifc theory is that caterpillars need a quiet spot to transform themselves into a completely different lifeform. Growing wings and planning your first flight must require deep concentration. Given the above, and the high incidence of caterpillar mortality caused by birds, spiders and other predators, I would be inclined to bring those caterpillars inside to assure they have the best chance of completing their life cycle. You can feed them milkweed leaves and keep them in a clean container, then relocate the chrysalises once they’ve formed. Jiminy Chrysalis! Monarch and Queen Chrysalis Tree. Thank you, dental floss. Learn more about rearing Monarch butterfly caterpillars at the Monarch Watch website. Those of us who raise caterpillars in our kitchens and gardens have been known to use pins, tape, glue, fishing line–and dental floss, my favorite–to fasten chrysalises to twigs, coffee stirrers, chopsticks, potted plants, even the kitchen cabinet. Why do we do it? To ensure their completion of the life cycle is one reason. But it’s also one of the most rewarding aspects of “butterflying.” To witness eclosure, the moments surrounding a butterfly’s emergence from its chrysalis, is always magical. The only way to do that is to have the chrysalis in captivity, where you can monitor its progress and not miss the miracle of metamorphosis. 1. Putting them in direct sun–a hot window, for example–can damage their development. A bright, protected spot is best. 2. Monarchs and other species need to hang vertically so that when they eclose, gravity can assist in their wings forming properly. Swallowtails are different. Try to emulate the chrysalis’ natural positioning as much as possible. 3. Once the butterfly emerges, it needs several hours before it can fly. If you’ve brought it in the house to watch, leave the newborn alone until its wings harden up and it starts beating them slowly. Then you can release it outside. 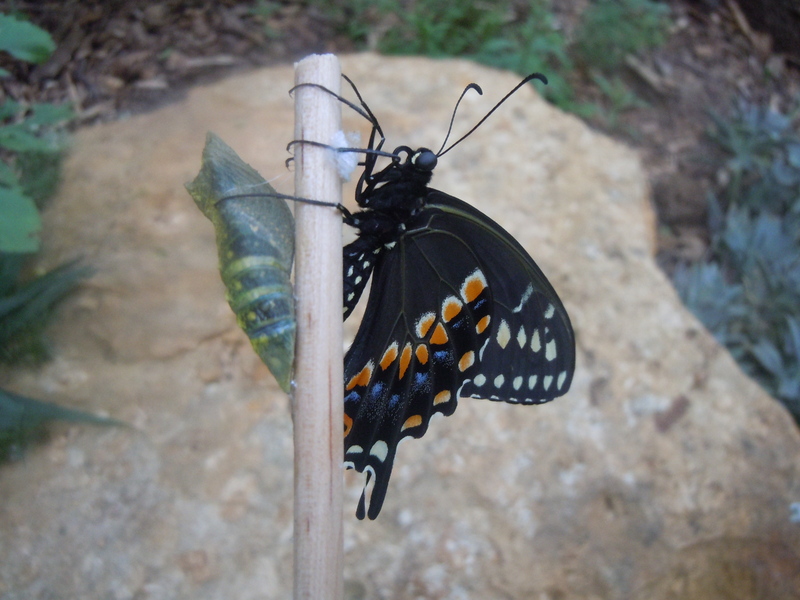 Eastern Swallowtail Butterfly and Sister Chrysalis adhered with nontoxic glue to a Chopstick. An excellent resource for relocating chrysalises and reattaching them without causing harm is Shady Oak Butterfly Farm. Edith Smith, butterfly meistress, and a member of the International Butterfly Breeders’ Association, has been raising butterflies for decades and graciously shared the useful links below. Thank you, Edith! For more info on this topic, check out our post on How to Move a Monarch Chrysalis. I was trimming my sage bush this afternoon and brought some of the branches inside to put in a vase. As I was putting them in the vase, I heard something hard fall off and looked down and found a green-and-gold chrysalis–now identified as a monarch. The chrysalis is hard and appears undamaged, but my stomach turns when I remember the thump sound. Should I try to hang it somewhere in case it’s ok, or is it likely damaged from the fall and best to put it out of its misery now? Yes you should definitely stick it up somewhere. If you have tape try to tape the tiny black tip on the top to a wall or surface where it can emerge from safely. It should be in an upright position. Good luck! Well, I hung the chrysalis indoors and was surprised to find a young butterfly in my bedroom a couple of days ago! I was surprised because the chrysalis was still green, and I’d expected it to become clear when she was ready to emerge. At first I was very excited, but I soon noticed a few problems. Her wings look very fresh, one of her legs is either a bit crooked or weak, and one of her antannae droops to the ground. I thought she was just wet from emerging and left the door open for her to fly away when she was ready, as well as a small base of fresh-cut nectar flowers I’ve seen other monarchs enjoy in case she needed to feed first (or wanted to stay out of the rain). But the next day she looked the same. We gently took her outside, where she tried to fly and promptly fell over helplessly. I made hummingbird sugar water to see if she should drink some for energy, which she did only with my husband propping her over the edge of the plate. I read about OE and am worried whether that is her problem or whether she’s deformed from impact with the floor as a chrysalis. But I also wonder whether it’s possible she emerged from her chrysalis too soon? She surprised me because I checked it every day and it was still green, not dark or clear. Is that normal? Has anyone seen that before? Is there any chance she’ll recover if we continue to care for her? Our monarch butterfly chrysalis is flat on the ground. What should I do? out about this issue. I really like all of the points you’ve made. I have 5 Monarch cats that are on just what’s left of the Common Milkweed plant. I’ve lost four cats to what I believe could be NPV. One of my dead cats I found on the above said Common Milkweed. Should I try to move my other cats from that Milkweed? If so, how do I go about it? 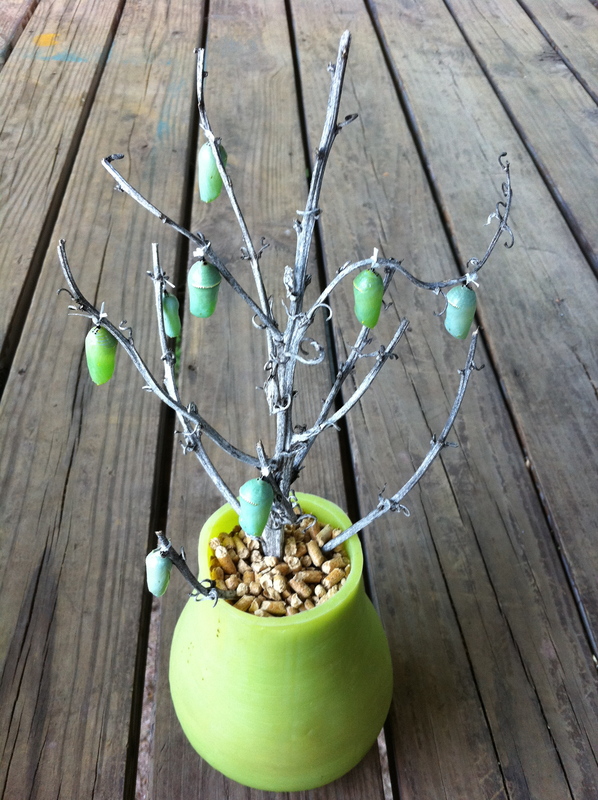 I have 20 chrysalis on a small manufactured tree I purchased for Christmas ornaments. They are hatching like crazy and I’m a newbie afraid I may not be doing the right things. I have been able to release 12 without a problem but now the weather is stormy and it will be below 60 degrees tonight for at least an hour. Five of my little creatures have moved from the Chrysalis Tree to screens on the windows. Rain is to stop in a couple of hours (5 PM) and at 5 AM it is suppose to get to 59 degrees. Will they be okay if I release them after 5 PM? My monarch chrysalis fell from the spot I had it hanging. Some yellow liquid came out of the bottom of it…Dead? I have a monarch caterpillar that started hanging from my umbrella stand RIGHT beside my pool. It’s literally an inch from the concrete and it’s going to get wet/destroyed if it stays there. Suggestions on how/where to move it? Follow the directions in the post where you left your question. Good luck! My wife started helping Butterflies April 30, 2016. I am retired and try to help in some areas. As of June 30, 2017 we have released 316 for year 2017 (6 months). She has cages for Monarchs, Gulf Fritillary and Black Swallow Tail. Yesterday I found chrysalis in floor of cage and its silk was black and hard. I tried to pin it as she does with the silk, the black broke off. I now know to use glue on paper towel. How do we save this one? HELP ME PLEASE.. I Don’t know what to do. I have a small piece of branch that had a cocoon attached (that was cut from a low hanging tree while Cleaning Yard up) I put end of limb in water didn’t help. The leaves have started to shrivel up causing the area they had to become smaller & some of the bigger baby caterpillars are coming out on limb. Is there a way of making an artificial cocoon to put these babies back in. I don’t want them to Die. COULD WE POSSIBLY CHAT THROUGH FACEBOOK MESSENGER OR EVEN BY PHONE. I put the limb I’m a large Aquarium and put some fresh leaves in it. PLEASE HELP ME. I have a butterfly with a broken wing and I feed her and keep her indoors in a nice terrarium. The odd thing is that although she knows how to uncurl her proboscis now to eat, she will only eat from my fingers. I’ve tried to get her to use the little sponge with Gatorade I have in her cage but she just won’t do it. Also, immediately after she’s done eating she shivers and shakes for a minute or two. Is she okay? Her half wing fell off but with 3 out of 4 she can get around the cage fine. Thank you. skinnier now, is there something wrong with them? What should I do to remove them if they are not alive anymore. Your help will be greatly appreciated. I don’t know what to do. I have found 4 healthy green chrysalides this week that look to have been eaten at the bottom. I am in southeast Florida. I would really like to know what it could be – lizards, rodents, birds? I counted 45 cats that succesffuly form chrysalides during the last cycle about 6 weeks ago, and even outdoors there was about an 85% success rate. This time the cats are disappearing and there are far less chrysalis and now the chrilysalides are being eaten as well. Maybe their were fewer predators in the cooler months. It is warm and active now. I guess will have to go back to using the enclosure. If you can give me an idea of what critter eats the bottoms of the chysalis, it would help my curiosity. Hi. The chrysalis (the very first day) fell to the floor of my pop up mash container. Can I leave him alone on the floor or should I relocate him and how do I do that please? We are having a bid storm with lots of wind so I brought in my Baby Bug as I call him/her and very carefully tied thread around the cremaster. Now he is hanging in our bug jar, lid off, and tomorrow I will make a permanent home for butterfly rescue. Its a monarch and we get lots and lots of caterpillars but in six months this is our first visible chrysalis. Of course we will let him go after he hatches! I am SO excited, especially with our two bushes and knowing we can rescue caterpillars and endangered chrysalises (chrysali?). Anything I can do ? My boyfriend brought in a monarch caterpillar yesterday. I live in Mo so it’s really cold. I put it in a jar with leaves a few sticks. What else do to keep this little one alive? I’ve never done this before. I have 3 chrysalises but live in MN and concerned about the late start these butterflies will have when they finally emerge. Can I mail them to you so they can emerge in more hospitable climate and have better chance at migrating? Thanks! Did anyone give you any advice on mailing them to a warmer climate? My sister in NJ is planning to mail hers to Texas today and is not sure if she should. Can a a hardened chrysalis be overnighted? Can it be bumped in the mail while not hanging from anything? Sorry I have no answers, just the same questions you probably have. Has anyone ever tried this? I did not get any responses to my questions but I overnight mailed ($65/per) hardened chrysalises – 3 to Kansas and 2 toTX. Of those 5 only 1 emerged – it was the earliest one to pupate. I’m not sure what to make if it – if late season cats are less vigorous, or were the exposed to extreme heat or cold in transit. I had 11/11 success during the summer for those that I “raised” and released in MN. Difficult to make a recommendation after such results. Good luck though. I have been observing monarchs and their caterpillars for years. This summer several chrysalis have disappeared without a trace. Sometimes the day after they formed sometimes 3-5 days later. Based on the various locations it seems like it could be a bird. What kind of birds eat Monarch Chrysalis ? we have a lovely crop of caterpillars that will be moving on very soon, Im wondering however, can I simulate a habitat right where they are and put in new vegetation and a net around them with branches and safety so we can experience them outside where they currently are versus bringing them indoors? I am so nervous about our first caterpillars! We have 6 and I’ve covered the area with bird netting. They seem OK but if they venture off to find a nice place to attach I’m afraid they will disappear! Dare I bring them indoors? We have a screened porch but I have never done this before. I don’t want to harm them. I found a monarch caterpillar hanging upside down on a tomato cage about 20 feet from my milkweed plants. From your entry, I now guess that it had its last meal and found its quiet spot. I will move it inside to my butterfly cage but don’t know whether it’s best to do so before it turns or just keep an eye out and wait now that it’s hanging upside down. And if now, how? I relocated 2 Monarch Chrysalis from an unsafe area. They both were formed on the same day and one hatched in 11 days, but the other one is still dark green, but it has been 18 days already and it still hasn’t hatched (this chrysalis fell onto rocks), so do you think that it will ever hatch? Our Monarch chrysalis took 18 days! I read everywhere 10 to 14 ans was thinking he had died when all of a sudden his chrysalis got clear yesterday. He is fine, he is just a late bloomer. We had a Monarch chrysalis in our pine tree and some time soon after it emerged it fell in a pile of needles and tore its wings. I put it on a stick but it’s bleeding and one wing is very badly torn. Is there anything I can do? My first monarch butterfly just emerged this morning. I have it in a mesh cage with a milkweed plant . It has been out for about 12 hours and I plan to let it outside in the morning. Is there something I should feed it in the meantime. Water? Sugar water? If you let it go in the morning it will find some nectar. They don’t really eat the first day. Good luck! An emerging Monarch, before it was fully open, fell from the roof of the mesh cage to the floor of the mesh cage. What to do? It seems to be trying to open its wings. We have been blessed with four swallowtail caterpillars. We’vebeen watching them for a couple weeks as they have been changing, three on our small lime tree and one in a butterfly kit. The one in the container changed to chrysalis yesterday, one on the tree moved to patio and changed, one on tree changed overnight and the largest, not changed yet, we moved to the containe, anticipating its change very soon. We are in Dallas area. I see catapillars on plants but never see cocoons what should I do .? I found a caterpillar that had yellow and whit fur with random longer black streaks and its been in its cocoon for about a month. when I have been checking on it its moving on the pointy end, does this mean its trying to come out and cant or what? I just found a chrysalis on one of my lawn chairs I was cleaning. I didn’t want to contaminate it with the chemicals I was using so without damaging it, I removed it. But I don’t know what to do with it now!? Can anyone help please? You can use a non toxic glue to adhere it to a surface that allows it to hang properly so when it emerges its wings form properly. See my previous post on how to move a Monarch chrysalis. I need HELP!! I am new to the Butterfly World! I started a butterfly garden-Miami, Florida. I have had tons of caterpillars but I never see a chrysalis. Once and a while I will see a butterfly. The flower beds are plentiful with host plants. What am I doing wrong? THey often leave the plant to make the chrysalis, but it’s also possible they are getting eaten by predators late in the game. If you want to witness the whole process, then bring them inside so you can keep an eye on them. We recently planted milkweed plants & have seen caterpillars on them. Saw a chrysalis in Feb. but had a cold snap & it didn’t make it. I found a chrysalis under my picnic table yesterday & went to look today and it was gone. What could have happened to it? I am so disappointed. Very few caterpillars survive predators to make a chrysalis, and few of the chrysalis survive to hatch. So when you see those caterpillars, bring them inside. I have a mesh cage with a big potted milkweed inside the cage. I put the tiny cats on that plant and zip it up to keep them safe. But you can just put the cats in any container with a screen on top to keep them from crawling out keep adding fresh milkweed leaves daily. Keep it on a kitchen counter or table.They will make the chrysalis on the top screen. I can’t recall the last time I saw a butterfly chrysalis in Boston, but I will keep my eyes open, here and down on the Cape. Thanks for the info. As my mom used to say: you find what you’re looking for. I never noticed them until a few years ago when I started looking. Those gifts await you, just take a look. Thanks for writing. Keep looking! We’re here in the Roslidale neighborhood of Boston, and I found this site while looking for info on how to care for a monarch chrysalis that was attached to one of our garden tomatoes. It’s September now, so when this little one hatches, she’ll be making the 1000 mile journey to Mexico! Ask a Naturalist.com » Can I move a monarch butterfly chrysalis? Thanks for writing, Tom. Let us know what happens to the Monarchs.